Mark Zuckerberg might have felt aggrieved after watching The Social Network, tipped to win a few Oscars tomorrow, but he should consider himself lucky he didn't get the treatment meted out to Steve Jobs in the made for TV movie Pirates of Silicon Valley. Zuckerberg comes across as a creep in a few scenes of The Social Network, but he's always shown to have a vision for big things. The people he works with -- the Winkelvoss twins, Edward Saverin, and Sean Parker -- all help up to a point after which Zuckerberg outgrows them. He might betray or demean these people, but there's never any doubt that he's doing so at a point when they have become a hindrance to Facebook's growth. Noah Wylie's Steve Jobs, on the other hand, is not only much nastier than Jesse Eisenberg's Zuckerberg, he shows little trace of the visionary we all know Jobs to be. He refuses to acknowledge parentage of his daughter Lisa, allowing her to be raised in poverty while he makes millions from the Apple IPO. He takes LSD and dances and chants with the local Hare Krishnas. He insults a prospective employee by placing his bare feet on the table while conducting an interview and asking him insulting questions about his sexual history. Jobs and Bill Gates are the pirates of the movie's title. Jobs steals the mouse and graphical user interface from Xerox; Gates buys DOS cheap from a programmer and sells it to IBM as his own work; he then steals the Mac operating system and makes it the basis of Windows. Jobs is so focussed on IBM as Big Brother, that he fails to see the emerging threat from Microsoft, the Big Brother of the future. The only guy portrayed with any sympathy in the movie, the only protagonist who actually builds anything, is Apple's co-founder Steve Wozniak. Soon after the movie was broadcast, Jobs invited Wylie to a Mac event, trying to draw some of the sting from the movie's critique. Zuckerberg followed in this tradition, appearing with Eisenberg on an episode of Saturday Night Live. We did all realize by this time that the difference in computers, the thing that made some more special, was the software. Macintoshes and PC's had similarly capable hardware. But the Macintosh had the special OS and apps that worked that way. That was the reason why people bought Macintoshes. But, even though we openly said this, we ran Apple as a hardware company, because that's where the big revenues were. We were a software company pretending we were a hardware company. We built factories and ordered parts and hired sales teams and set up distribution and sold our products. We had to handle surplusses that weren't sellable as well. We put out a huge investment. Let's say that the annual profits were $1B. Pretend that we spent $4B and brought in $5B. Not bad for a computer company. But you can look back and see that these profits were all due to people wanting the Mac OS. The way that screen looked and worked, with you instead of against you. You could just look and see how to do things, rather than remember it all (this was back a ways in time!). The only way people could buy this OS was to buy our hardware. So it was easy on paper to tell a convincing story that we were a great hardware company. And our $5B revenues put us well up on the Fortune 500 list of companies. It guaranteed Apple very high respect in big business circles. But what if we'd just sold the OS to anybody who wanted to make hardware to run it. What if we'd even given up our hardware business. Let's say we licensed our OS. Assume that we'd have brought in the $1B it was worth (you could argue less but you could also argue more) every year. We'd only be a $1B company instead of a $5B company. Not as worthy, right? I'd like to suggest that this would have been better for our shareholders. The company wouldn't have had to take the huge investment risk, wouldn't have to set up factories that might be disposed of when things turned on us, wouldn't have had to melt down tons of unsellable hardware, wouldn't have been caught with lots of unused parts, wouldn't have had to hire and manage so many employees. We just could have sat back with a good programming team and collected on the Macintosh OS. We'd have been more like Microsoft. But this wouldn't have made us as big a company as selling hardware. It seems that if we'd looked ahead at the importance of software, we'd have seen the mistake in this. Looking at sales and profit charts (scroll to bottom of linked page) for Apple, we see an astonishing pattern: revenues went up steadily between 1981 to 1995, from a mere 335 million to a massive 11 billion. This indicates Apple had a great run for a decade after Steve Jobs was sacked in 1985. After 1995, though revenues declined precipitously, no doubt affected by the success of Windows 95. Again, this would seem to bear out Wozniak's analysis of Apple as a software company pretending to be a hardware firm. 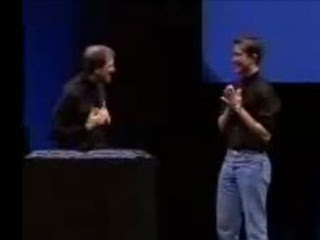 When Steve Jobs returned as CEO in 1997, sales were at 7 billion. Despite the success of the iMac, they kept going down till 2002, at which point they were at 5 billion annually. That's when an incredible resurgence began, helped by the Mac OS X, iPod, Apple Stores, iTunes, iPhone and iPad. Still, they only crossed the previous high sales mark in 2005, with sales of 13 billion. The chart then goes like this: 2006, 19 billion; 2007, 24 billion; 2008, 37 billion; 2009, 42 billion; and 2010, an incredible 65 billion dollars. It was like something being torn down almost completely and rebuilt. The rebuilding was based on Apple's famed combination of well-designed hardware and intuitive software, which was finally affordable to a mass client base. Instead of Apple becoming more like Microsoft, Microsoft was left scrambling to become more like Apple. I don't know when Steve Wozniak wrote that comment about Apple essentially being a software company, but it must be evident to him now that a software company would never have been able to produce the devices that have made Apple the largest tech company in the world. Great engineer though he may be, it's clear Wozniak is no visionary. I wish Pirates of Silicon Valley had given some play to the creative side of Steve Jobs; the film would've been much better for it, and in some ways preempted The Social Network. All good points. Jobs actually made things - things you could hold in your hand and use. Beautifully designed things that look like volcanic glass or some beautiful piece of obsidian. I've never understood what Zuckerberg did that was so essentially different from, say, MySpace. He wrote some code and made a new template. But thats about it though, right? In the film incidentally I thought the stand out performance, amazingly, was from Justin Timberlake. Thanks, Adrian. Good your comment showed up, Google's been acting up a bit. I agree Timberlake was unexpectedly good. It helped in a way that he's a celebrity outside of films. His status compared to that of the other actors sort of mirrors the status of Sean Parker in the geek world.